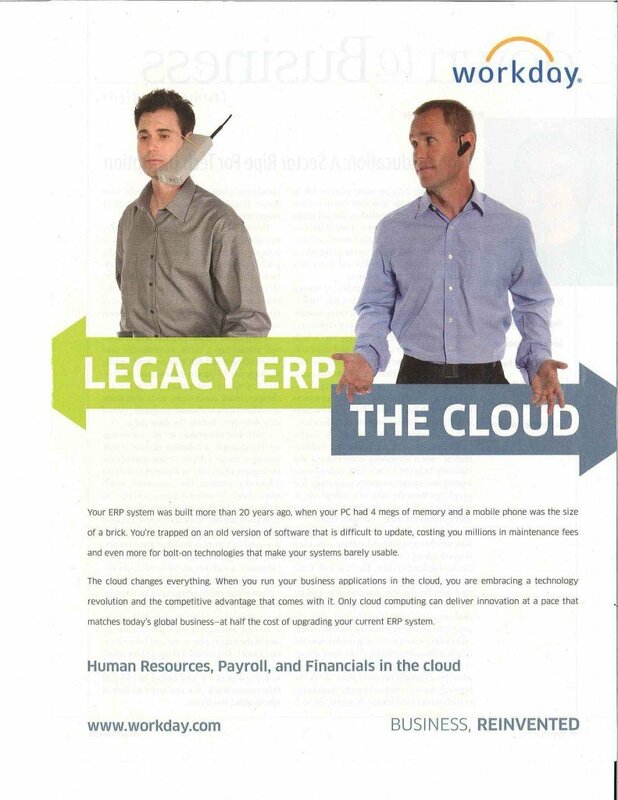 I was reading a technology magazine the other day and came across this ad (image below) that I had to share. First, the image is eye-catching and sort of funny. But to me, the thing that kicks this ad up a notch (and I think makes it effective) is the straight-forward, conversational copy. Too often I see ads and articles laden with technology gibberish and million dollar words (when a $5 word would have done the job) that ultimately say a whole lot of nothing. This one is direct and edgy. Scroll down if you’d like to read the copy that accompanies the ad. Your ERP system was built more than 20 years ago, when your PC had 4 megs of memory and your mobile phone was the size of a brick. Your trapped on an old version of software that’s difficult to update, costing you millions on maintenance fees and even more for bolt-on technologies that make your systems barely useable. The cloud changes everything. When you run your business applications in the cloud, you are embracing a technology revolution and the competitive advantage that comes with it. Only cloud computing can deliver innovation at a pace that matches today’s global business – at half the cost of upgrading your current ERP system. Randy – thanks for your comments. I agree, technology changes rapidly. As I saw in a LinkedIn post related to the departure of another Sage executive announced this week .. “change is the only constant.” As it relates to the cloud, it seems to me that one of the biggest changes there has been in the marketing. That is to say, the “Cloud” concept has been around for a long time, but the attention that it’s now getting (marketing $$$) is really driving awareness. Interesting how quickly the technology – or shall we say – adoption of technology happens. Just a couple of years ago, established businesses avoided “Web-Based – aka Cloud” programs and services. Now, it seems like many companies request “Cloud” based systems. Like the copy by the way! The analysis and comments add value.